July 17, 1975 marks the end of the Space Race between the United States and Soviet Union. An Apollo capsule carrying three astronauts docked with a Soviet Soyuz capsule carrying two cosmonauts. It was the first time two different countries partnered together and met in space. The Apollo-Soyuz Test Project was designed to test a docking module that was designed by both US and Soviet engineers that would be used in future joint missions. To prepare for this mission, astronauts visited both country’s facilities and trained aboard simulators to familiarize themselves with each other’s systems. Russian cosmonauts learned English and American astronauts learned Russian. The Apollo capsule was the same command and service module used in the Moon missions with a couple enhancements such as extra maneuvering fuel and the new docking system. The Soyuz capsule was the same workhorse capsule used by the Soviets for all their space missions. Their docking system would serve as an airlock between the two spacecraft when they docked. Both capsules were launched on July 15 and entered Earth orbit. The Soviet launch had their own first, as It was the first time one of their launches was televised. 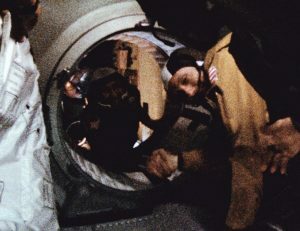 The docking was achieved 52 hours later and was televised worldwide. The five astronauts opened the docking hatch and greeted each other. The crew spent two days together completing a series of experiments and exchanged gifts to mark the occasion. This mission showed how well US and Soviet space programs could cooperate.